Aim: To evaluate the shear bond strength between the dentin substrate and computer-aided design and computer-aided manufacturing feldspathic ceramic and nano resin ceramics blocks cemented with resin cement. Materials and Methods: Sixty cuboidal blocks (5 mm × 5 mm × 5 mm) were fabricated in equal numbers from feldspathic ceramic CEREC ® Blocs PC and nano resin ceramic Lava™ Ultimate, and randomly divided into six groups (n = 10). Each block was cemented to the dentin of 60 extracted human premolar using Variolink ® II/Syntac Classic (multi-steps etch-and-rinse adhesive bonding), NX3 Nexus ® (two-steps etch-and-rinse adhesive bonding) and RelyX™ U200 self-adhesive cement. All specimens were thermocycled, and shear bond strength testing was done using the universal testing machine at a crosshead speed of 1.0 mm/min. Data were analyzed using one-way ANOVA. Results: Combination of CEREC ® Blocs PC and Variolink ® II showed the highest mean shear bond strength (8.71 Mpa), while the lowest of 2.06 Mpa were observed in Lava™ Ultimate and RelyX™ U200. There was no significant difference in the mean shear bond strength between different blocks. Conclusion: Variolink ® II cement using multi-steps etch-and-rinse adhesive bonding provided a higher shear bond strength than the self-adhesive cement RelyX U200. The shear bond strength was not affected by the type of blocks used. Aims: To assess the deproteinizing effect of bromelain enzyme and compare it with 5% sodium hypochlorite (NaOCl) on shear bond strength before application of the adhesive system. Materials and Methods: A total of 30 extracted human premolars were divided into three groups, each one consisted of 10 teeth. The occlusal surface was wet ground to expose superficial dentin. In Group 1, teeth were etched; in Group 2, teeth were etched and deproteinized with bromelain enzyme; in Group 3, teeth were etched and deproteinized with 5% NaOCl. Upon completion of the adhesive procedures, resin composite was inserted into the plastic tube and light-polymerized. All specimens were stored at 37°C in water for 24 h, and the specimens were transferred to the universal testing machine, and then subjected to shear bond strength analysis at a crosshead speed of 1.0 mm/min. Statistical Analysis Used: Data were statistically analyzed using one-way analysis of variance and unpaired t-test at a significance level of 0.05. The statistical analysis was performed using SPSS version 12.0.1 for Windows (SPSS Inc., Chicago, IL, USA). Results: The bond strength results were significantly influenced by the application of bromelain enzyme. Statistically significant differences were not demonstrated in control group and NaOCl-treated group. 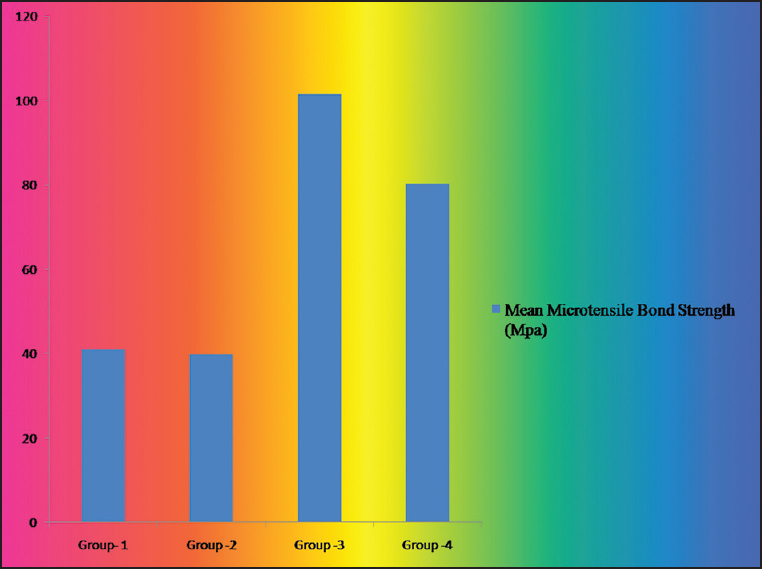 The highest bond strength was seen in bromelain enzyme-treated group. Conclusions: Within the limitations of the present study, it was concluded that removal of unsupported collagen fiber with bromelain enzyme after acid etching results in improved bond strength. 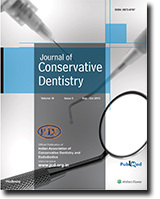 Aim: The purpose of this study is to compare the efficiency of fluorescence-aided caries excavation (FACE) to remove carious dentin primary teeth with that of conventional methods. Methods and Materials: After caries excavation was carried out, dentin surfaces were conventionally inspected using visual tactile criteria and 415 cavities which were classified as caries-free, re-inspected with Face-Light and caries detector dye (CDD) methods. Orange-red fluorescing areas classified as carious dentin, as well as stained carious dentin. All the data were recorded according to localization of the caries and determination efficiency of the methods. X 2 test was used to compare the mean values of both Face-Light and dye applications, while Wilcoxon test performed to evaluate the effectiveness for each diagnostic method. Results: A total of 273 patients with 415 Class II (OM/OD) cavities (1.65 ± 0.52 teeth per patient) with carious lesions in molar and premolar teeth, were examined. Out of 415 teeth, in 149 teeth (35.9%) no caries findings had been illustrated. While FACE detected remaining carious or partially removed areas in 237 teeth (57.2%), CDD stained only 29 teeth by itself (P < 0.05). Conclusion: In conclusion, FACE has a higher detectability compared to visual inspection and caries detector dye in diagnosis and removal of carious dentin. Background: There is a growing interest in chemomechanical excavation (papain) in permanent molar teeth. There are several studies dealing with primary molar teeth. Aim: The aim of this study was to evaluate the influence of conventional method and Carie-care (chemomechanical method) on the microshear bond strength (μSBS) and the type of failure of an adhesive system to caries-affected dentin of permanent molar teeth. Materials and Methods: Twenty permanent molar teeth with carious lesions extending into the dentin were selected. Through the center of the carious lesion, teeth were sectioned mesiodistally and divided into two groups based on the method of caries excavation (conventional and chemomechanical method). The time required for the completion of excavation procedure was noted. Samples were again divided into two subgroups in each according to the method of restoration (Ketac N100 and Filtek Z350 composite). The bonded interface was subjected to μSBS testing in a universal testing machine. Fractured surfaces were examined under a stereomicroscope, and representative specimens were examined under scanning electron microscope for the type of failure. Statistical Analysis: It was achieved with unpaired t-test and Kruskal-Wallis H-test at 5% level of significance. Results: The μSBS values of Carie-care groups were similar to that of the conventional method. 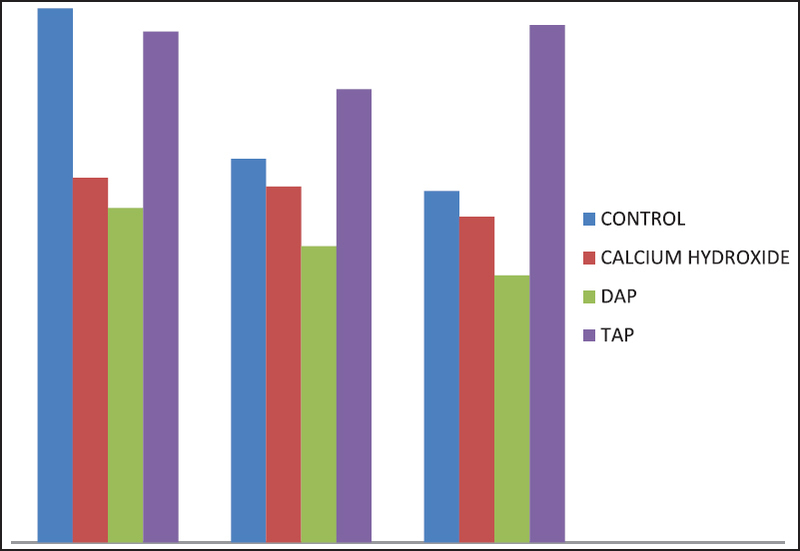 The μSBSs of resin composite were significantly (P < 0.001) more than that of resin glass ionomer bonded irrespective of the method of caries excavation. Conclusion: A papain-based chemomechanical agent can be used safely as a method for caries removal when employing conventional adhesive systems. Objectives: The study aimed to evaluate the effectiveness of the combination of two natural extracts in varying ratios for removal of smear layer either alone or supplemented with sonic agitation. Materials and Methods: Fifty extracted single-rooted teeth were collected, disinfected and decoronated below the cementoenamel junction to obtain standardized root length of 10 mm. Root canals were instrumented using rotary files at working length 1 mm short of the apex. Specimens were divided into six groups according to the irrigation protocol as follows: Group A - Distilled water, Group B - 17% ethylenediaminetetraacetic acid, Group C - Herbal extracts in 1:1 ratio, Group D - Herbal extracts in 1:1 ratio supplemented with sonic agitation, Group E - Herbal extracts in 2:1 ratio, Group F - Herbal extracts in 2:1 ratio supplemented with sonic agitation. Specimens were longitudinally sectioned and evaluated under scanning electron microscope for smear layer removal efficacy. Obtained scores were statistically analyzed using one-way analysis of variance and post-hoc test. Results: Among all, Group B showed the best results followed by Group F. Remaining other groups showed inferior outcome (P < 0.05). Conclusion: The combination of two extracts in 2:1 ratio was slightly better than 1:1 ratio and the smear layer removal efficacy was further improved when accompanied with sonic agitation. Aim: To analyze the difference in the micro-tensile bond strength of specimens made with two different adhesive systems and compare them with two homogenous substrates. Materials and Methods: Sixty permanent mandibular molars were mounted in acrylic blocks and sectioned with exposed dentin surfaces. Samples were then divided into four groups. To Group-I Adper Single Bond 2 and to Group-II Adper Self-Etch plus bonding agents were applied. For Group-I and Group-II beams consisted of resin composite in the upper half and dentin in the lower half. In Group-III beams were made of only dentin. In Group-IV beams were made of only composite. Fifteen specimens of each group were taken for the micro-tensile bond strength test. Statistical Analysis: The results are analyzed using one-way analysis of variance and Critical Difference test. Results: The interface bonded with the two adhesive systems had lower micro-tensile bond strength than those of dentin and resin composite and the self-etching adhesive Adper Self-Etch plus had comparable bond strength with total-etch adhesive Adper Single Bond 2. Conclusion: The bond strength values for current adhesive systems cannot be compared to the micro-tensile bond strength of dentin and resin composite, and self-etching adhesives have comparable bond strength with total-etch adhesives. Purpose: to evaluate the shrinkage, polymerization stress, elastic and bulk modulus resulting from composites formulated by siloranes, 2 nd generation ormocers, and dimethacrylates. Materials and Methods: The bonded disc method was used to evaluate volumetric shrinkage. The polymerization stress was evaluated by mean of the Bioman. Cylindrical specimens (5 mm thickness and 6 mm diameter) were submitted to gradual loading. Young's and bulk modulus were obtained from the slope of the stress/strain curve. Data were analyzed using one-way analysis of variance and Tukey's test (5%). Results: Grandio and ormocer showed significant higher elastic and bulk modulus. Silorane presented significant lowest bulk modulus and maximum shrinkage. Ormocer and silorane presented lower values for the maximum rate of shrinkage. Extra-low shrinkage (ELS) composite presented the greatest maximum shrinkage. The higher maximum rate of shrinkage was attained by Grandio and ELS, statistically similar from each other. The silorane showed lower values of maximum stress and maximum rate of stress. The higher values of maximum stress were presented by ELS and Grandio, statistical similar between them. Grandio showed the significantly greatest maximum rate of stress. Conclusion: Silorane showed to promote lower shrinkage/stress among the composites, with the lowest elastic modulus. Ormocer showed lower shrinkage/stress than methacrylates despite of its high modulus. Background: Lithium disilicate ceramic system consists of glass ceramic ingots with different grades of translucence which may influence its flexural strength. Aims: To assess the three-point flexural strength of the different lithium disilicate-based ceramic ingots (IPS e.max Press/Ivoclar Vivadent) with different levels of translucence and shade. Materials and Methods: Six groups of ceramic ingots were selected to represent different levels of translucence and shade (HTA1, HTBL2, LTA2, LTB2, MO2, and HO). They measured 25 mm × 5 mm × 2 mm (n = 10), according to ISO 6872 specifications, and tested on a universal test machine (EMIC). Statistical Analysis Used: A one-way analysis of variance (ANOVA) was used (α = 0.05). Results: The results (in MPa) were: HTA1 = 392.98; HTBL2 = 390.74; LTA2 = 390.46; LTB2 = 389.92; MO2 = 390.43; HO = 391.96. ANOVA showed no significant difference among groups (P = 0.1528). Conclusions: Different levels of translucence, opacity and shade of ingots did not affect their mechanical strength, and the use of these ceramics should be guided by the esthetic demands of each clinical situation. Context: Where nonsurgical endodontic intervention is not possible, or it will not solve the problem, surgical endodontic treatment must be considered. A major cause of surgical endodontic failures is an inadequate apical seal, so the use of the suitable substance as root-end filling material that prevents egress of potential contaminants into periapical tissue is very critical. 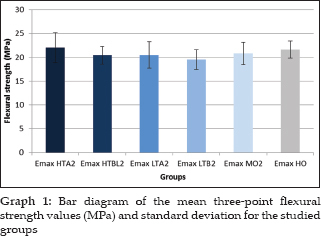 Aims: The aim of the present ex-vivo study was to compare and evaluate the three root-end filling materials of mineral trioxide aggregate (MTA) family (white MTA [WMTA], grey MTA [GMTA] and Portland cement [PC]) for their marginal adaptation at the root-end dentinal wall using scanning electron microscopy (SEM). Materials and Methods: Sixty human single-rooted teeth were decoronated, instrumented, and obturated with Gutta-percha. After the root-end resection and apical cavity preparation, the teeth were randomly divided into three-experimental groups (each containing 20 teeth) and each group was filled with their respective experimental materials. After longitudinal sectioning of root, SEM examination was done to determine the overall gap between retrograde materials and cavity walls in terms of length and width of the gap (maximum) at the interface. Descriptive statistical analysis was performed to calculate the means with corresponding standard errors, median and ranges along with an analysis of variance and Tukey's test. 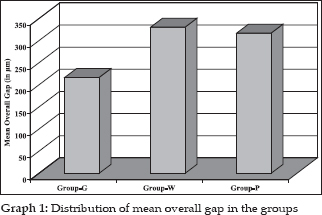 Results: The least overall gap was observed in GMTA followed by PC and WMTA. While after statistically analyzing the various data obtained from different groups, there was no significant difference among these three groups in terms of marginal adaptation. Conclusion: GMTA showed the best overall adaptation to root dentinal wall compared to PC and WMTA. Being biocompatible and cheaper, the PC may be an alternative but not a substitute for MTA. 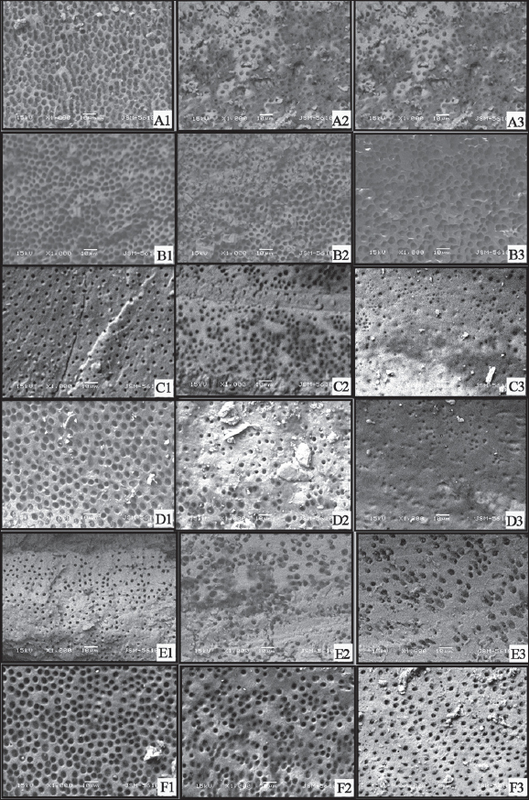 Aims: The purpose of this ex vivo study was to evaluate and compare the weight of debris and volume of irrigant extruded apically from teeth using different preparation techniques. Subjects and Methods: Thirty extracted human mandibular premolars with single canals and similar lengths were instrumented using hand ProTaper F2 (25, 0.08; Dentsply Maillefer, Ballaigues, Switzerland), M-two (25, 0.06; VDW, Munich, Germany) and WaveOne Primary (25, 0.08; Dentsply Maillefer, Ballaigues, Switzerland). Debris and irrigant extruded during instrumentation were collected into preweighed Eppendorf tubes. The volume of the irrigant was measured, and then the tubes were stored in an incubator at 70°C for 2 days. The Eppendorf tubes were weighed to obtain the final weight when the extruded debris was included. Three consecutive weights were obtained for each tube. Statistical Analysis Used: Data were statistically analyzed by one-way analysis of variance and Student's t-test. Results: There were no statistically significant differences among the groups. The WaveOne reciprocating system showed the maximum amount of apical extrusion of debris and irrigant among all the groups. The least amount of debris and irrigant was observed in ProTaper hand instrument (P > 0.05). Conclusion: All instrumentation techniques were associated with debris and irrigant extrusion. Aim: This study aims to evaluate and compare microleakage at the occlusal wall and cervical wall in Class II cavities restored with one SonicFill Bulk Fill composite and two conventional Bulk Fill composites. Materials and Methods: Thirty freshly extracted teeth were divided into three groups of 10 teeth each. Standardized Class II cavities were made on the mesial and distal surfaces of each tooth and restored using SonicFill Bulk Fill composite and two conventional Bulk Fill composites, Tetric Evo Ceram, and X-tra fil. After storage, thermocycling and immersion in 0.6% rhodamine dye solution specimens were sectioned and evaluated for microleakage at the occlusal and cervical walls using confocal microscope. Statistical Analysis Used: Kruskal-Wallis test, Wilcoxon Signed-Rank test and Mann-Whitney U-test. 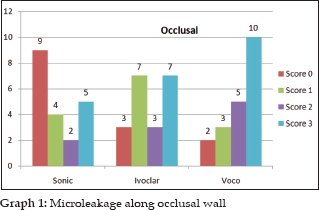 Results: The results demonstrated that in the occlusal wall and cervical wall, SonicFill Bulk Fill composite, showed significantly less marginal microleakage than the other groups. Conclusion: Based on the results of this study, SonicFill Bulk Fill composite showed less microleakage than the other conventional Bulk Fill composites. Aim: To evaluate the effects of calcium hydroxide (CH), triple and double antibiotic pastes (DAPs) on the bond strength of Smart-Seal obturation, C-points with Endosequence Bio-ceramic (BC) sealer to the root canal dentin. 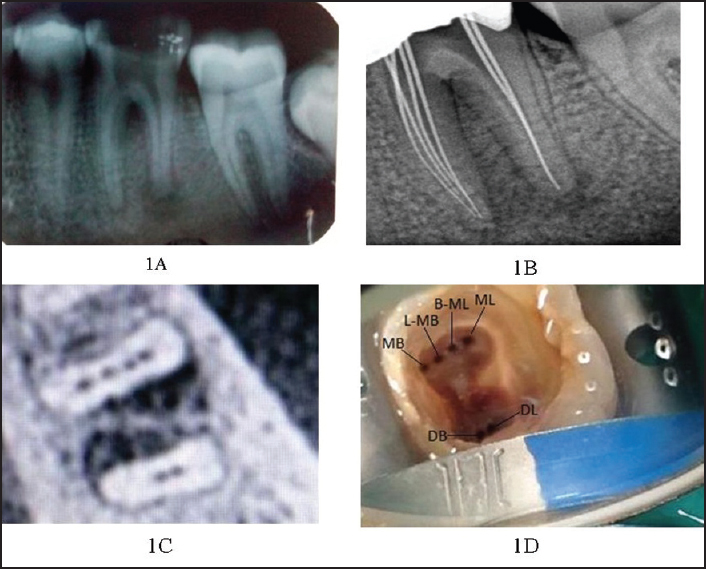 Materials and Methods: Sixty-four freshly extracted single-rooted human mandibular premolars were de-coronated and prepared using rotary Pro-taper system with full sequence till F3. The specimens were randomly divided into a control group (without intracanal dressing) and 3 experimental groups that received an intracanal dressing with either CH, DAP, or triple antibiotic paste (TAP) (n = 16). The intracanal dressing was removed after 3 weeks by rinsing with 10 mL 17% ethylenediaminetetraacetic acid, followed by 10 mL 3% sodium hypochlorite. The root canals were then obturated with C-points and Endosequence BC sealer. A push-out test was used to measure the bond strength between the root canal dentin and the obturating system. The data were analyzed using two-way analysis of variance and Tukey post-hoc test. Results: The push-out bond strength values were significantly affected by the intracanal medicaments (P < 0.001), but not by the root canal thirds (P > 0.05). In the middle and apical third, the bond strength of the TAP group was higher than those of the CH and DAP groups (P < 0.05). Conclusions: The DAP and CH did not affect the bond strength of the novel hydrophilic obutrating system. TAP improved the bond strength of Smart-Seal system in the middle and apical thirds. Internal anatomy of pulp is complex. The first mandibular molars typically have two roots, one mesial with two root canals and another distal root, which contains one or two canals. A 20-year-old female patient reported with intermittent pain and incomplete root canal treatment in left lower back region since 1-week. Refined access cavity revealed initially two canals in mesial and two canals in the distal root. With operating microscope and cone beam computerized tomography, two additional canals (L-mesio-buccal and B-mesio-lingual) were identified in mesial root. One-year follow-up showed patient was asymptomatic and complete healing of periapical radiolucency. Contemporary techniques, as well as the availability of bioactive and adhesive materials in endodontics, have helped revivifying teeth that were deemed hopeless. 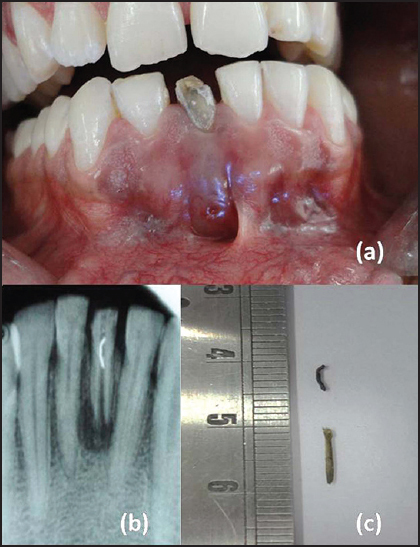 These newer materials and techniques would enable the clinician: (a) to predictably stop microbial activity (b) to achieve a total corono-apical fluid tight seal and (c) to strengthen mutilated teeth by obtaining intra-radicular reinforcement through mono-block effect. 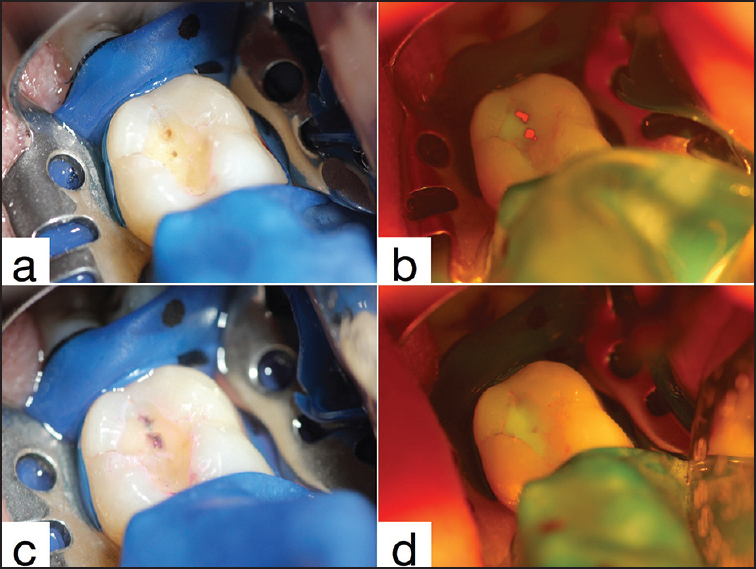 This case report demonstrates the successful treatment of a mutilated anterior tooth with the use of bioactive and adhesive materials to obtain a total seal and mono-block effect. This article also shows the use of a simple method in the placement of root filling cement into the root canal.